I was thrilled to see Danny Boyle’s Isles of Wonder spectacle that was the Opening Ceremony of the 2012 Olympiad use landscape to such great effect. The opening scenes representing historic rural Britain were the archetypal bucolic idyll of wildflowers, thatched cottages, milkmaids and shepherds tending animals, cricket on the green and villagers dancing round the maypole, all watched over at one end by a mound representing Glastonbury Tor capped with a giant oak tree. It called to mind J. R. R. Tolkien’s The Shire, inhabited by hobbits and Richard Adams’ Watership Down. Fluffy white clouds drifted by (apparently equipped with real water), although they weren’t really needed as a real rain shower only just finished as the show began. Only missing were Gainsborough’s Mr and Mrs Andrews, the Suffolk landed gentry posing under the sheltering embrace of an old oak tree on their estate. The oak here signifies stability and continuity, and a sense of successive generations taking over the family business. The landed gentry have even been compared to the oak, holding Britain together. (see: Hagen, Rose-Marie & Hagen, Rainer (2003). What great paintings say. Taschen. pp. 296 300) An apt symbol for a country struggling in recession in the 21stCentury? The film sequence which started the performance proper, (entitled Green and Pleasant Land) was itself a journey from country to city, showing footage of the Thames flowing from its source in the Gloucestershire countryside through to the East End and arriving at the Stadium. 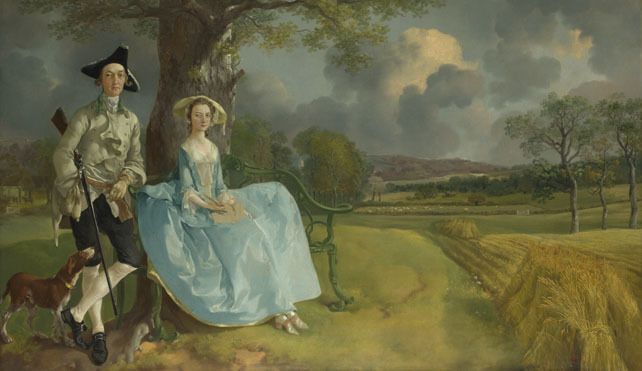 Gainsborough’s Mr & Mrs Andrews has been called the “Perfect image of rural England.” (Waldemar Januszczak Every Painting Tells a Story, by ZCZ Films for Channel 5) But the couple only make up half the picture. What Gainsborough’s painting actually shows is the land, fields cultivated using new methods. Mr Andrews is showing off not only his new wife and his land, but perhaps most importantly his utilisation of the latest techniques of agriculture. Higher economic productivity is the source of his wealth. So that ultimately this is not a picture about the past, but a glimpse into what the future holds for the countryside on the cusp of the Industrial Revolution. This will mean hardship for the majority of the rural population, not least due to the enclosures acts (deportation was the sentence for poaching) with the result being a general move off the land towards crowded urban areas where work was to be found. Danny Boyle’s Olympic interpretation of Britain today began with idealised images of the countryside then moved through to an urban experience with a boy-meets-girl storyline told through the characters’ use of texting on their mobile phone. Throughout it used digital technology to spectacular effect in the lights and staging around the arena, featured electronic music, and even Britain’s role in the development of the Internet (Sir Tim Berners-Lee made an appearance seated at a desk in front of computer). All of this whilst the audience itself was busy Tweeting, photographing and uploading via mobile phone. It came as no surprise therefore to see the athletes parade onto the ground with their digital camcorders and phones held up high to capture that very audience in the act of filming them. 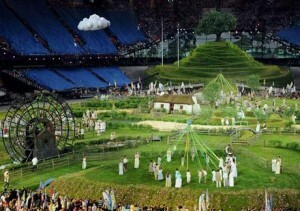 This entry was posted in Spirit of Place and tagged Gainsborough Mr & Mrs Andrews, London 2012 Olympic opening ceremony. Bookmark the permalink.